“United Parcel Service uses jumbo jets, hybrid electric vans and, sometimes, drones to deliver nearly 5 billion packages each year,” writes The Wall Street Journal (June 30, 2017). But a push into a less glamorous transportation method—golf carts—has touched a nerve with drivers in one of its home bases. UPS can now use golf carts to deliver packages in Kentucky– thanks to a new state law allowing delivery drivers to use the vehicles on public roads. 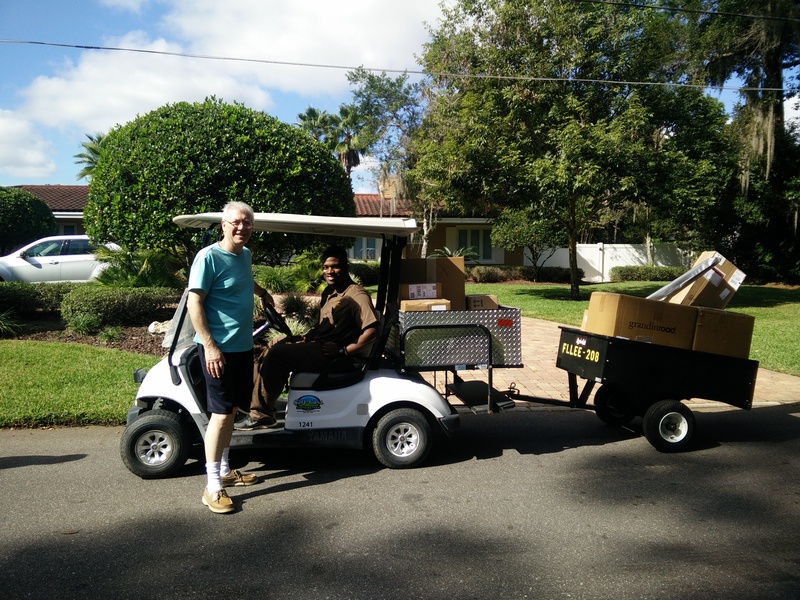 The company is using retrofitted golf carts to complement its fleet of brown delivery trucks primarily during the winter holidays, when daily volumes can rise 2/3 from normal levels. But union leaders argue that having the vehicles share the road with cars and trucks puts workers at risk. They also object because at UPS golf cart drivers earn less than traditional truck drivers. The golf carts, which ​are modified with a flatbed or pull a trailer containing the packages, are driven by part-time workers. The carts generally don’t go faster than 15 mph and are only allowed to operate in residential areas and on public roadways with a posted speed limit of 35 mph or less. Controlling costs is a major issue at both UPS and FedEx, which have taken steps to optimize driver routes through routing systems, automate more sorting facilities and deliver more packages to drop-off points like stores. UPS has a number of unique delivery methods to accommodate local quirks, including horse-drawn carriages on Michigan’s Mackinac Island and gondolas in Venice, Italy. What are the advantages of this new logistics tool? FYI, Mackinac island Michigan has no cars-you have to get there by boat, and then it’s horses or bikes or foot only. I’m a seasonal golf cart driver in Florida. The golf cart is stored in my garage and packages are dropped off there each weekday (they have my garage entry code). I sort the packages and deliver them in my neighborhood and to a couple others nearby. Currently I am delivering 30-45 per day but am told that the quantity will increase to over 100 packages during the peak season. UPS wants me to be finished before dark because there is only one very small headlight on the cart. I stay off any main thoroughfares and use sidewalks to travel between neighborhoods. The golf cart has a large detachable wagon on the back, but is otherwise not retrofitted. There are no turn signals or “slow moving vehicle” signs on the cart. I am paid $10 an hr. – significantly less than a regular driver yet handle very large packages up to 70 lbs. Thank you for the comment. Very interesting view and I can see why the unions are so unhappy.